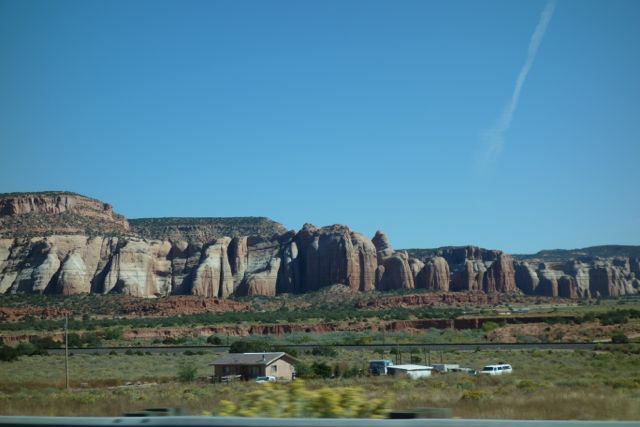 Living in southern California, one gets to Arizona every now and then, but to get to New Mexico requires something like volition — which means I certainly hadn’t set foot in New Mexico before. Nor had I ever actually driven over the California-Arizona border, the point at which the landscape goes all Krazy Kat. Having read collections of that strip over and over again in childhood (I got deep into prewar newspaper comics for a while there, which seemed to speak to me of a better, more nonsensical time), I remembered that George Herriman drew a great deal of aesthetic inspiration from the American southwest, but I’d forgotten that its setting of Coconino County takes its name from an actual county in western Arizona. But New Mexico looks even more Coconino County than Coconino County. After what felt like a few hours of admiring the landscape, we made our first New Mexican stop in Gallup, a town along Route 66. 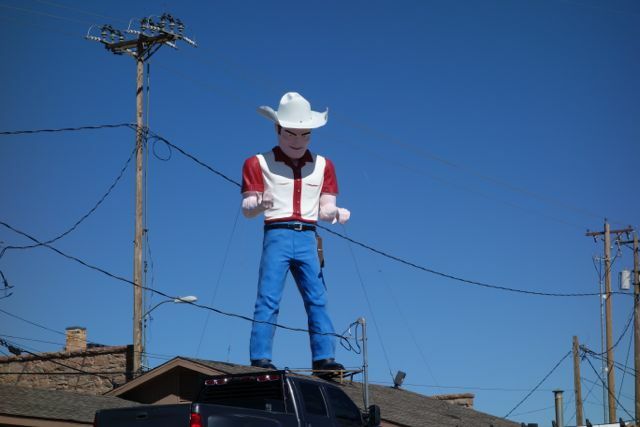 Those on the Krazy Kat tour of the southwest — or, indeed, anyone with a certain idea of America — will want to spent some time attempting to get their kicks on Route 66, but all I’ve seen of it suggest that few kicks remain to be had. Countless other observers of American life have said this better, but most towns serviced primarily by the withered bloodstreams of the railroads or the old U.S. Highway System, rather than the mighty arteries of the Interstate Highway System, have become towns on life support. 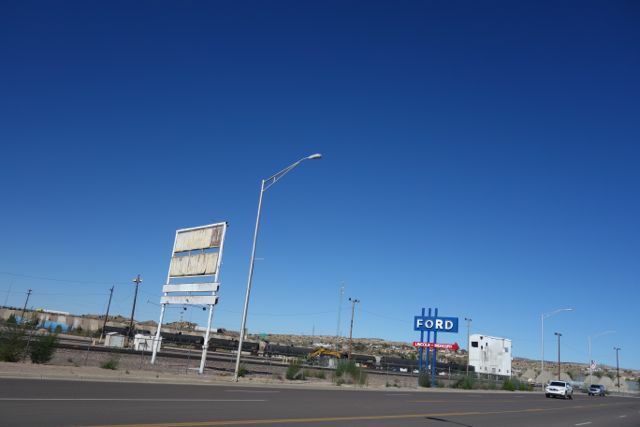 And so at least half of Gallup’s businesses along Route 66 have permanently shuttered, some of them what looks like decades ago. Of those that remain, many have posted loud “BUYING PIÑONS” notices in their windows. Piñons, it turns out, are nuts that grow on local pine trees, and though a surprisingly robust economy appears to have grown around them, nothing about it strikes me as a good sign. But just a block or two off the forlorn Main Street of America, we found a café in continuous operation since 1970 that gave us a heartening dose of New Mexican cuisine. And by New Mexican cuisine, I mean one comestible above all: the sopaipilla. I first learned about sopaipillas from Adam Cadre’s novel Ready, Okay!, whose protagonist delivers what I recall as a rapturous monologue in praise of their deliciousness. Still, it took me years to actually try one since, at the time, something about the spelling — particularly that “I” in the middle — struck me as unnecessary, show-offy. But these lightly fried, unsweetened pillows of steam-filled dough have nothing excessive about them, and despite the importance of cutting back on one’s food intake while on the road, I find myself able to put away two or three of them at a sitting without even realizing it. Some of this gluttony I put down to a simple when-in-Rome enjoyment of place and the culinary culture thereof. Some of it I explain away as a desire to put a little more money into a local economy clearly in dire need of it. And besides, where am I going to get a decent sopaipilla in Seoul? This was written by Colin Marshall. Posted on Friday, October 16, 2015, at 8:36 am. Filed under diary. Bookmark the permalink. Follow comments here with the RSS feed. Comments are closed, but you can leave a trackback.